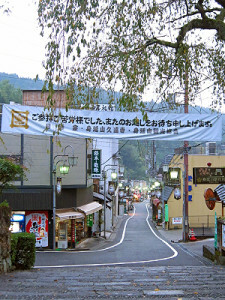 If you are coming from Michi-no-Eki ‘Shimobe’, keep ‘Motosu-Michi’ (National Road 300) for about 10 kilometers. At an intersection of ‘Kamisawa’, take National Route 52 to the left and keep ‘Minobu-Michi’ (National Route 52) for about 6 kilometers. At the grade separated crossing, turn right so that you are on ‘Minobu-michi’. Heading for Kuon Temple, you would have to be turning into a small road called ‘Minobu-michi’ from ‘Motosu-michi’ (National Route 52). On the entrance of the sacred Mount Minobu, there stands the Main Gate of Kuon Temple. 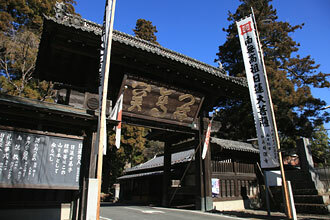 The Main Gate of Kuon Temple. Photo from Kuon Temple Official Site. Driving along the road for a while, you will start to be finding shops, most of them private concerns, on both sides of the road. 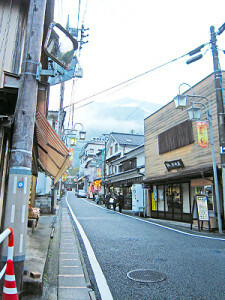 This is ‘Monnnai Shopping Street’, a shopping area that still remains as they were in the past, within the territory of the Temple. 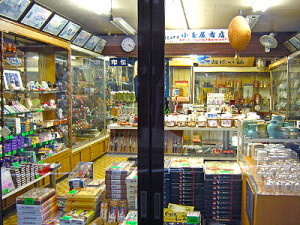 Most of the shops are 2-story built, either old or in old style which still keeps the classical vision. 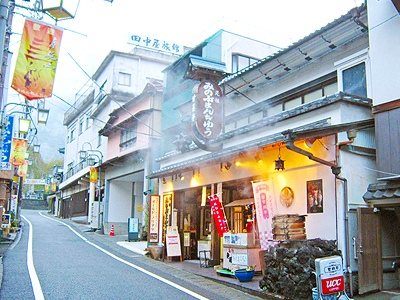 You will find many shops here which are related to the belief of Nichiren Buddhism. Followers buy their Buddhist alter equipment, praying beads, incense and candles here for their memory of visiting the head temple. Some buy special outfits of pilgrims which you may see some dressed up around the temple. 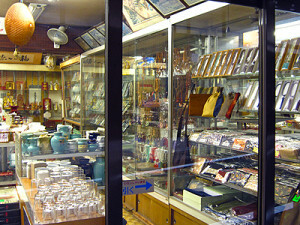 Visiting one of these Buddhism equipment shop is really interesting and we are sure you could find an interesting souvenir. 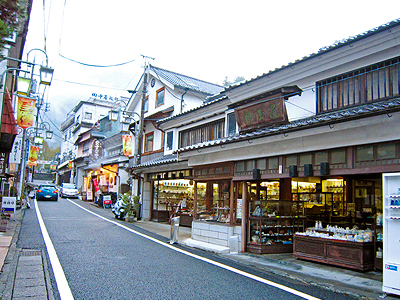 Apart from Buddhist related shops, there are souvenir shops, restaurants, coffee shops, inns, Japanese confectioners and other daily shops where you can enjoy as they differ from those you see in normal towns. Steamed dumplings with sweet Azuki paste sold here. The street is only about 1 km long, suitable to look at every shop in a short time and we are sure that you will be able to find something interesting which you can’t find in other places!